Psypoke - View topic - What were the first pkmn you used to beat the Elite 4? What were the first pkmn you used to beat the Elite 4? How did these pokemon even survive Loreli...? Please tell me this wasn't the team you used the first time in FR/LG. Umm... I forgot the rest. How do you get a red gyrados? off topic but you get one in silver,crystal and gold, by fighting one thats in the plain open. in other ones its just like catching other shinys, hope i helpled. 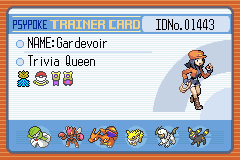 The Elite Four in FR/LG must be tougher then the one in emerald. If i had lv. 55 pokemon i would have finished in under 10 mins. Although i used a lot of Full heals i came out gaining some money. Tetric the level 74 Blastoise! I haven't beaten the elite 4 on fir red yet because i didnt work on the game really. LVL 42 ! I think he was handy against Agatha because of Rest. I still can't figure out how I won. A level 100 and nothing else. No back-ups, and no items. This is my team when I beat the Elite 4 on my first try.